crimson peaks filled with UNESCO-protected wildlife. 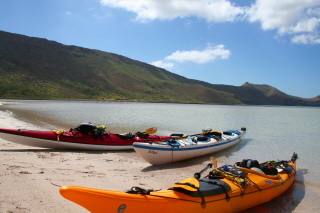 Just off shore from La Paz, in south Baja on the Sea of Cortez, lies one of the finest sea kayaking destinations in the world...Isla Espiritu Santo! Pristine white sand beaches, crystal clear water, deeply indented bays protected by intriguing rock formations, abundant marine life and numerous neighboring islets...these are some of the characteristics that bring many of our guests back to this enchanting island year after year. This is one of North America's favorite sea-kayaking trips. And deservedly so! It offers the adventurer glorious days voyaging around one of the most appealing islands. The rugged shoreline, off-shore islands and series of headlands and deep bays make each day a new adventure. 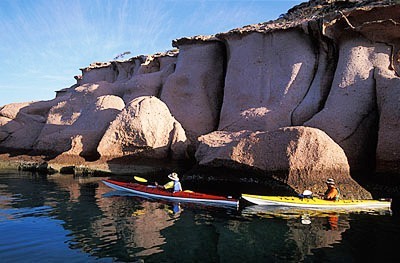 ​Isla Espiritu Santo really is paddling in paradise ~ just ask anyone that has been there! 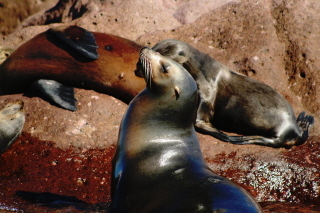 Discover the pure wilderness of Baja California & the Sea of Cortez. Explore desert islands, hike a forest of towering cacti, swim with sea lions and during certain times of the year - see whales, dolphins and scores of rare birds! "I have been on about 8 -10 trips like this with other companies, but this trip was over the top. "Thanks for accommodating me (vegetarian) . We can also arrange combined biking & kayaking trips! soft secluded sandy beaches to camp on and sunsets waiting to be soaked in. Come visit today! Flights (airfare/transportation from your home), items of a personal nature, gratuities, travel insurance. Casa Bentley Boutique Hotel is 'Baja Living at its Best' located in the historic town of Todos Santos.